Icron Technologies is a leading global developer and manufacturer of high-performance USB and KVM/video extension solutions for commercial and industrial markets including Medical, Military, Industrial Automation, Machine Vision, ProAV, Education, and Mining/Exploration. Icron’s patented extension technology extends USB and video devices over many media types including Cat 5e, Fiber, Wireless, PowerLine, and over a corporate LAN. 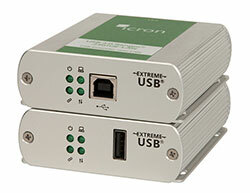 The new EL5353 and EL5363 KVM extender systems features Icron’s latest ExtremeUSB® technology, supporting a higher USB 2.0 throughput of up to 40 Mbps, in addition to supporting USB audio devices such as microphones and speakers. The form factor of these new extenders is the same as the discontinued EL5100 and EL5200 models noting they are not backward compatible with the 5100/5200. EL5353 DVI Uncompressed 1920 x 1200 100m Single CAT 5e/6/7 cable. CAT 6 recommended. 40Mbps Keyboards, mice, flash drives, audio peripherals, USB 1.1 web cameras. EL5363 HDMI Uncompressed 4K, 1080p or 1920 x 1200 100m Single CAT 5e/6/7 cable. CAT 6 recommended. 40Mbps Keyboards, mice, flash drives, audio peripherals, USB 1.1 web cameras. Refer to the Product Comparison Table (located below the images), referencing the USB type, maximum distance, transmission media, power adapter location and the number of USB ports of each product. 1 Where USB 2.0 is listed, USB 1.1 is also supported. USB 3.0 extenders are not backward compatible. 2 Specified Category cabling is a minimum requirement; higher grades are supported (e.g. Cat 6, Cat 7). 3 100m or more is achievable when using USB 3.0 bulk traffic cameras; 50m with storage type USB 3.0 devices. 4 Power is delivered over transmission link cable to the REX. 5 Either the LEX or REX can use a power adapter. Only one is required. 6 Up to 40m is achievable for all USB devices; 85m is achievable for most low powered HID USB devices. Call in and speak with one of our knowledgeable solutions engineers who will answer any questions you might have.